Unfortunately, the song Garden Party has been running through my head since I started knitting the Garden Party Shawl. Hopefully I’ll be able to turn off the music at some point. Because the shawl is a pure delight. While it has some interesting construction, don’t let that frighten you — the pattern tells you exactly what to do every step of the way with large clear charts and well-written prose. Last night I finished knitting out from the left side of the “backbone” of the shawl. I’ve just barely started the right side. Yesterday I had reason to haul out my light tent for some photos. Lucy was intrigued. It’s nice to have help with everything I do. Lucy is doing the same thing my kittys do, especially the 11 yr old Sandy. The have to check out anything new especialy box like structures to see if they will make a suitable kitty Habitat:-) Loved the Loopy Interview! Rick Nelson was my first concert–my mom just took me cause I think she couldn’t find a date……. Quite the photo-essay! Cat in light box! Damn, you’re original, intelligent, talented, catlike, non-violent, patriotic, pandimensional, semimultilingual, and ursine! Shawl is beautiful…I’m considering getting the pattern and will knit it if I get brave enough! 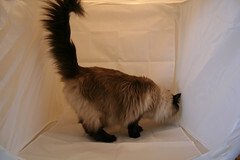 LOL And, I love the cute photos of Lucy in the light tent…just adorable. Your interview with Loopy on Sheri’s blog at The Loopy Ewe is really fun. Enjoyed reading it during lunchtime today. Hey, I have a helper just like that! Although, I’m guessing that the fur he leaves behind is a little more noticeable in a white light tent…. I don’t know why I continue to be amazed since I’ve been following your blog for over a year, but damn girl, you are able to knit so FAST!! The shawl is really moving along. I love that color too. I enjoyed the Loopy Ewe interview with you. Lucy, you’re too funny! You have to sing the song to someone else. That puts it in their mind and takes it out of yours. What they do is their problem!! What a cat-tail!! My kitties do the exact same thing when confronted with a new item !! Pics of Lucy are too adorable! I just love that garden shawl! So far, I have successfully avoided humming “Garden Party”, but the day is not over yet! 🙂 luv2Lucy&Wendy.m. GRRRREEAAATTTTTT interview @ the Loopy Ewe!!!!!!!!! ursine? I had to look that up. It is too bad cats simply do not have any curiousity. Garden Party, to me, is a preferable ear worm to the ‘other’ song mentioned in the comments. I started humming Garden Party to keep the other at bay. I need a new light box. Mine isn’t big enough for kitty photos. I bought the shawl pattern too. It is a construction technique I haven’t tried yet so I’m intrigued. I read your interview with Sherri at the Loopy Ewe and enjoyed it ! Did you see she now has some of Lawre’s bags for sale? Now I have that song stuck in my head!!!! 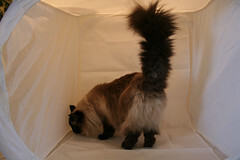 On another note, cats must have a “thing” about light tents. 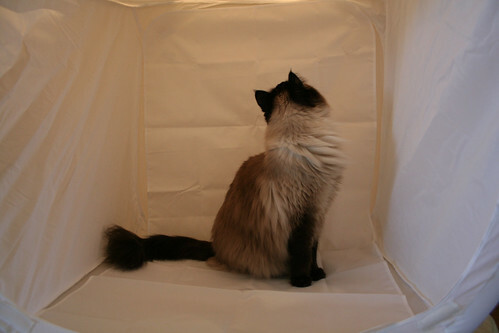 One of our cats is obsessed with our light tent. Thank you for planting that in my head. The shawl is lovely, and grew at an amazing rate, did you dip your needles in Miracle Grow? 😉 Did Lucy pose in the tent? Although I have seen it many times before, it always amazes me how different lace looks after the blocking. Pure magic. This one is interesting with its backbone and then knitting out. The color is beautiful. I have to admit the leaf one you did for your Mom is the most beautiful shawl I have ever seen. Perfect in every way. This one looks to be a runner up on the perfect scale. Does Lucy like empty boxes and bags? My cat loves grocery day cause he gets to jump into the empty brown bags. Wait… Garden Party? From Marillion? If so, I think I might just pass out. I could have sworn I was the only female Marillion fan in the world. Clearly Lucy believes the light tent is her new Bat Cave. meredith is helping me type that chorus from “garden party”. and how true it is! lucy, have momma move your blue kitty bed inside the tent! I think mummy should knit sweet little Lucy a nice, fluffy cushion for her new house [with matching blanket, perhaps]. Hello, just wanted to tell you or your computer-whiz that while I don’t get the cookie-announcement when I’m doing a comment (or I couldn’t send you this one), I do get that announcement when I want to change pages from the main page or from the archive page. Couldn’t get to your older entries either way, so had too skip them (boohooo). I’ve had a bad case of flu, so bad that even computering didn’t appeal to me, so I needed to go back quite a lot of entries. Lovely looking shawl so far. LOL @ Lucy. 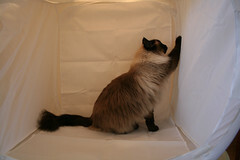 Seems kitties are attracted to light boxes like magnets! Wendy, just saw your Loopy Ewe interview – good job!! One question came up in the comments – what are your degrees in? (Nothing like nosy readers :>). 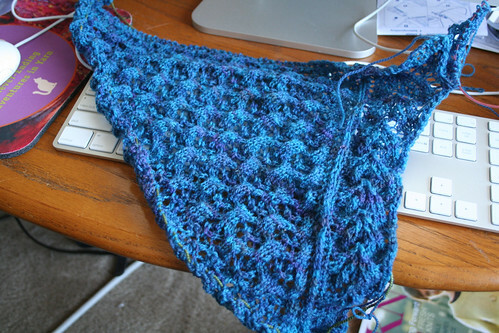 I love the garden shawl construction – I can always count on you to find something to work on. Oh my gosh!! Look at that fluffy tail!! Interesting shawl. I bought the pattern and notice it calls for 900 yards of yarn, and the Smooshy Baby has only 700 in a skein. So I’m assuming you’re using 2 skeins — and if so, are you alternating skeins every 2 rows, or are you just taking it on faith that they’ll match up well enough when you start the second one? Looking forward to seeing the finished shawl! Great interview with Loopy–I really enjoyed reading it. I’m hoping that at some point Loopy will interview Lucy! The shawl is lovely. But those Hot Stuff! mittens are incredible! They’re the best mittens I’ve ever seen. You did a stellar job, as usual. Those are REALLY cute pics of Lucy! !